“We’ve just looked at the Scantron assessment data for two of our schools, and they show great gains from fall to winter! They also show high usage and proficiency in Classworks. We’re looking at the other schools to see if this is a trend,” wrote Tracy Burt, Marion County’s School Improvement Specialist. In every strand, for both mathematics and language arts, students working in Classworks experienced marked growth compared to those who didn’t. And, for students using Classworks for more than five hours with greater than 70% average mastery, the growth was tremendous! Marion County Schools is an eleven-school district in Hamilton, Alabama. Alabama has adopted Scantron Performance Series (formerly Global Scholar) as its interim and summative state assessment for grades 3-8. 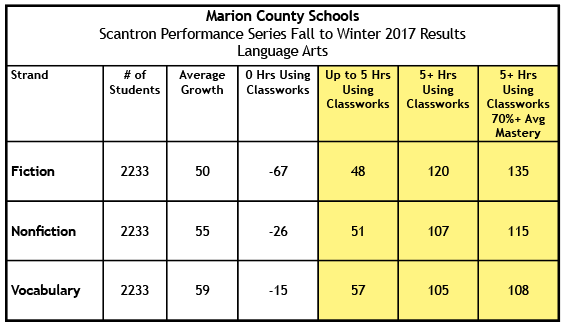 Marion County uses Classworks to individualize learning for every student using their Performance Series assessment data. The resulting growth tells the story of how Classworks, in conjunction with dedicated educators and students, can impact student success! “We are a districtwide family all working on this together! It is exciting to see the growth as a result of the hard work of our educators and students. There are clear parallels with the time our students spend in Classworks and their gains,” says Burt. The objective: test less, individualize more. 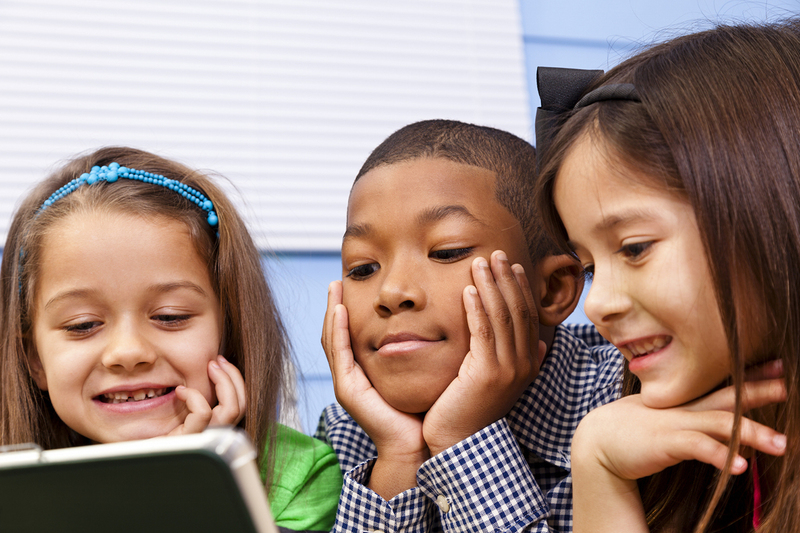 For the 2017-2018 school year, Marion County decided to implement Classworks districtwide for two essential reasons. 1. To put the test data they already have to work for every student. You’ve got interim, formative, summative assessments, and the list can go on. Although testing can be a valuable way to determine growth and increase performance, it also takes up valuable instructional time and classroom resources. 2. To give teachers back their class time. The district set the goal for all students that have learning gaps identified by their Scantron assessment to receive an Individualized Learning Path in Classworks. Principals have implemented schoolwide scheduling with the goal of each student having a minimum of one hour per week per subject in Classworks. Most Elementary schools are having students work in Classworks daily, with other schools now following that lead after seeing the growth experienced by the elementary school students. The data tells the story of success. Chelsea Johnson is not the only teacher that has the opportunity to celebrate tremendous growth. In each school where students are working on Classworks, those students’ Scantron assessment scores improved from fall to winter. A shining star in the district. Phillips High School (74% free/reduced lunch) had the greatest gains with a combined average growth in math and language arts of 360 points! “I had a chance to visit Phillips recently. They are so excited to celebrate their success,” says Burt. Phillips has a higher percentage of free and reduced lunch than other schools in the district. Raising the expectation raised the achievement. 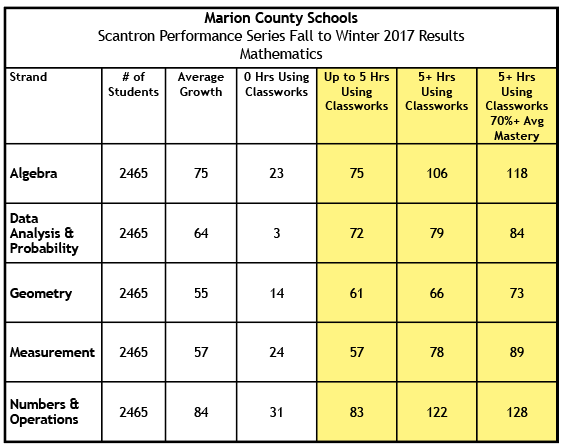 Marion attributes the growth their students are experiencing both to the perfect individualization Classworks creates and to raising the expectation to a higher level of proficiency combined with consistent monitoring and feedback. Marion County teachers are confident that the growth they are seeing will translate to success on their end of year assessment. But, they aren’t resting on their laurels. The district is looking to implement consistent blocks of time at every school for students to work on their Individualized Learning Paths in Classworks each week.